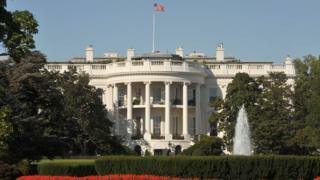 The Obamas have lamented patchy wi-fi coverage in the White House during a TV interview. There are a "lot of dead spots", President Obama revealed during a pre-Super Bowl interview on CBS. "It can be a little sketchy," added Michelle. The couple's daughters, Sasha and Malia, were "just irritated by it", she said. Mr Obama traditionally does an interview ahead of the biggest American Football game of the year. The president added he had been trying to improve the wi-fi "for the next group of folks". Mr Obama was accompanied on his pre-Super Bowl TV appearance by his wife for the first time. The couple also described their Super Bowl routine, saying they invite friends over to watch the match and eat food including pizza and nachos. "We let 'Let's Move' off the table," Mrs Obama said, referring to her campaign against childhood obesity.